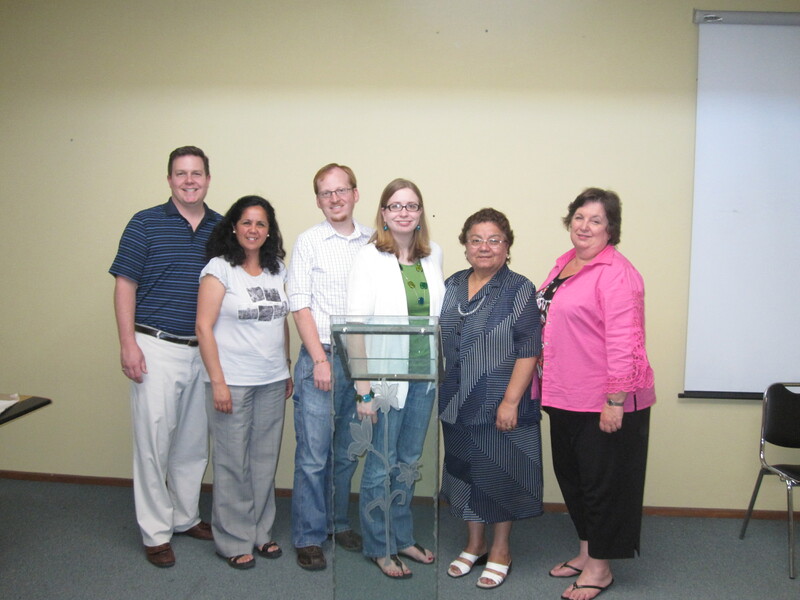 Yesterday we had the chance to meet with two ladies direct missions here in Chile. It was a really good meeting and I feel like we all came away with a little more clarity about how Blake and I will relate to UBACH (The Chilean Baptist Union). They wanted to know if we would send reports to the convention and participate in workshops and conferences. They also wanted to know if we would do our own thing or if we would concentrate our efforts on helping Marcelo. We told them that the reason we’re coming is to help Marcelo do whatever he needs help with. We assured them that we really want to work closely with the convention. A lot of the questions and concerns they raised were surprising to us, but most of their experience with missionaries has been with missionaries that operate differently than we do. Raquel also let them know that we’ll be living among the people—something that is also different that what their used to. Honestly, when the meeting first started I felt a little bit under attack because of all of the questions, but I see now that they were just trying to protect themselves from partnering with missionaries that have an agenda. By the time the meeting was over, I felt really good about how it went. We ended the meeting by listening to one of the women, Viviana, tell her story. She is actually a missionary, living in a neighborhood in Viña del Mar—an hour and a half from Santiago. When she first moved into the neighborhood, there were only three other Christians there. She said it was very difficult in the beginning because she is a single woman. Within a year, there were eight Christians and they were meeting in homes. Now they’ve grown to forty-five. They rent a building from the government, and they’re busting at the seams. They can’t add anything to the building and they don’t have enough money to buy it or anything other land. Still, she was so confident that God will provide the resources that they need. It’s very encouraging to us to learn about people from Chile doing mission work in Chile. Viviana took a big step of faith when she moved and she continues to trust in God to provide for the believers there. I guess this is where we’ll be sometime in the next six months—stepping out in faith and knowing that God will provide. How exciting! I love how you are meeting so many people and already building a great foundation for your work there. Just a note of encouragement as you continue to seek His guidance and to serve Him in Chile. We at First Baptist Swannanoa will contiue to lift you in prayer for His will to be clear for your lives. I love how God orders our footsteps and puts the right people in our lives to accomplish His will! On a less serious note, I was looking at the picture of you guys and wondering what in the world Bekah had on! Then I realized that it was a clear podium that you were standing behind!! I’ve had a serious migraine for over 2 days, so my brain’s a little slow!! Love you both so much!